It would be completely remiss to go a week without mentioning that we have indeed discovered time travel here in America. Yes, it is 2007 all over again. That nasty crisis, Fannie, Lehman, AIG, and Merrill never happened. It is all better now. The ‘Great Recession’ is long in the rear view mirror and we can party just like it is…1999? Or maybe 1929? There has to be something going on with all those 9s. So this week we’ll see if in fact we really have travelled through time and if this is in fact the ‘brave new world’ spoken so unabashedly by the mainstream press and flat-line EEG economic experts. We’ll let the statistics (biases and all) speak for themselves. Is it all glitz and glamour or should we in fact be asking for a refund on TARP, TSLF, QE, and every other alphabet soup government program/entity created to protect us from our own greed and even further, to keep us out of the next mess? If you really think that is going to work, just go find the nearest Greek immigrant and ask them how things are going back in the homeland. If you can’t find a Greek, a Spaniard or Italian will also suffice. There is an adage that youth is wasted on the young. In this case, wisdom appears to have been wasted on pretty much everyone else. At least the young have a reasonable excuse. The rest of us do not. So let’s run down the line and see what has happened to America, our liberties, and our economy since the Dow last ran above 14K. This week I’m not going to stop there either. There is way more than just economic liberty at stake here. Many of you will already know the details of the second portion of this week’s column, but for those of you who don’t, the text will be heavily punctuated with citations so you know this isn’t just another commentator’s opinion. 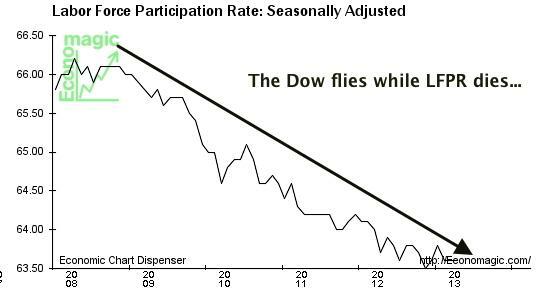 We all know the headline unemployment rate is a farce. So fraudulent is the headline rate in fact that the not-so-USFed has decided to peg its overnight interest rate policy decisions to whatever number the BLS happens to crank out. Go below the target of the day and up go rates and into the meat grinder goes what is left of the USEconomy. What is far more instructive in analyzing the employment situation is a look at the workforce itself and comparing it to the population. 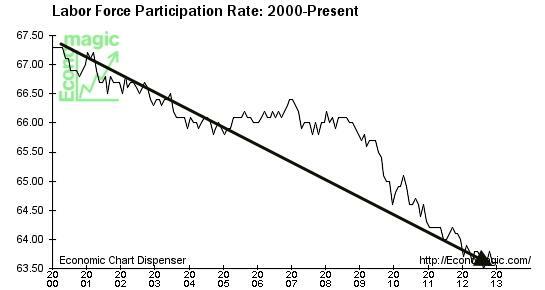 In November of 2007, the Labor Force Participation Rate or LFPR (according to BLS) was 66.0%. At that time, the workforce was 153.835 million. Moving forward to February 2013, the LFPR is now 63.5% with a workforce of 155.654 million. The number of people ‘at work’ full-time in November 2007 was 146.595 million compared to 143.222 million as of February 2013. Despite the fact that the workforce has grown by 1.819 million people due to population factors, there are actually 3.373 million LESS people working full-time now than were doing so in 2007. 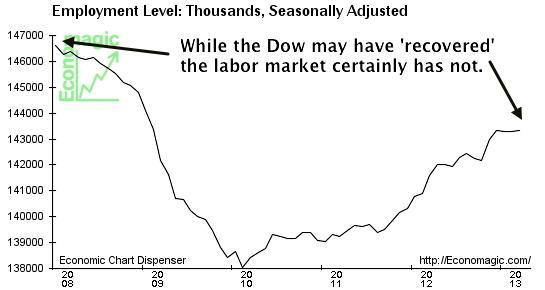 So much for the end of the ‘Great Recession’; at least from an employment perspective. Since today is ‘Jobs Friday’, let’s pick around the current report and see what’s what. On the surface the report looks solid – 236,000 jobs added in February with the unemployment rate dropping to 7.7%. The first big thing that jumps out is the massive downward revision to the January numbers from 157,000 jobs added to just 119,000. Oops! The second item worth noting is that the now infamous BLS birth/death model added 102,000 of the new February jobs. Which means they might exist, but then again, they might not. As noted above, Labor Workforce Participation Rate continued to drop, continuing a decade-plus trend. Now to the utterly disturbing. 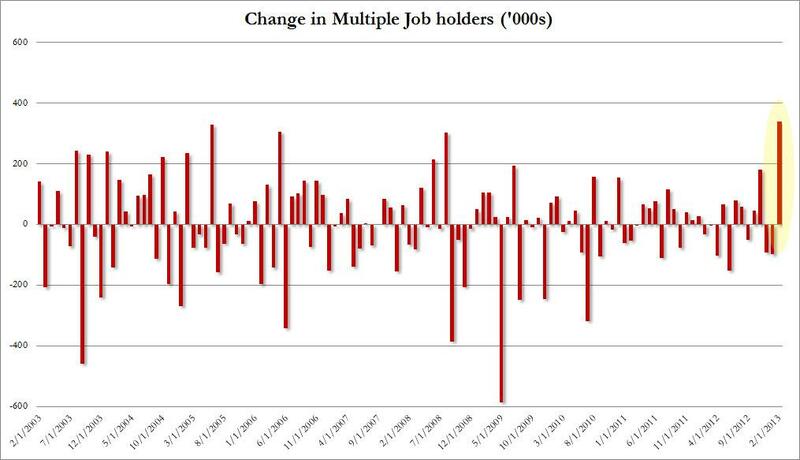 The number of multiple job holders rose by a record 340,000 in February. These are people who are working more than one job to make ends meet. The number of full-time jobs dropped by 77,000 and the number of part-time workers rose by 102,000. One can easily see how this becomes a quantity vs. quality issue. This is clearly another case where there is much more to the story than will be reported by the lapdog media. Once again, they are complicit in the growing national ignorance. One last thing of note just to show how little sense there is to anything. The headline unemployment number is beginning to get into the ballpark where the not-so-USFed will consider raising interest rates (the ‘target’ is 6.5%). Anytime someone even whispers about the end of QE or an increase in interest rates, the markets sell off big, yet the Dow opened up 50+ points this morning at another all-time high. Must we really talk about debt AGAIN? Yes, we must. Why? Because it is killing us. I’m not going to focus this time on the national debt; everyone with a pulse already knows what is going on there. I will add that we shouldn’t expect it to get better anytime soon either. The government went another $253 Billion with a ‘B’ in hock during February alone. Can we get a golf clap for those in Washington who spent their time golfing while modern day Rome burned? However, too often we are short-sighted. We have to look out into the future and see what might be a trend there if we’re going to make any type of serious macroeconomic forecast. So this time around we’ll look at the younger folks and see where they’re at in terms of debt loads. If this doesn’t sober you, nothing will. Many are accurate in portraying my own generation and the one before it as irresponsible for passing on a tremendous debt load to our kids and grandkids and they’d be correct. We are guilty as charged. However, we are doubly guilty and here’s why. At the same time we’re sticking it to them with unfunded liabilities for Social Security and Medicare, we’re also encouraging them to rack up their own debt and to do it at a young age. The very modest retrenchment that took place after the 2008 crisis showed a decrease in all kinds of debt across the board – except for student loans. Our kids never got the memo that the world had changed. 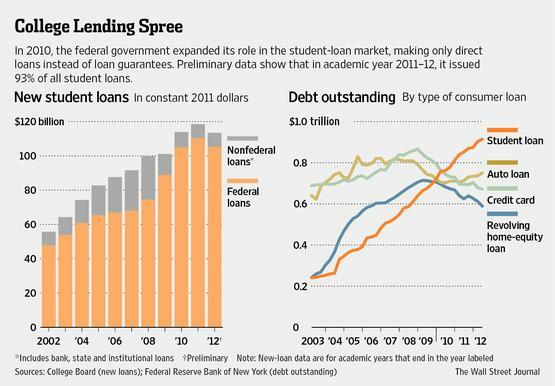 Student loan debt nearly DOUBLED from the end of 2007 to present. This is the biggest problem that nobody is talking about. These are our future consumers and they’re coming out of the gates gimpy with broken wheels due, for the most part, to crippling debt and rotten job prospects. 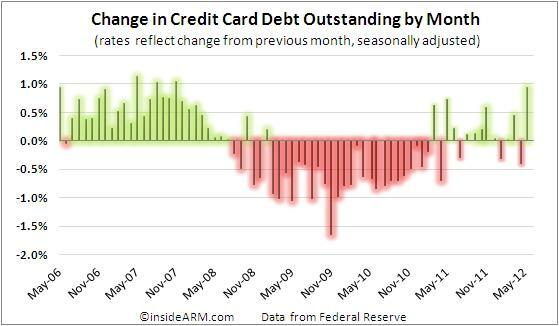 The adults aren’t doing much better as the data below shows a trend developing back into credit card debt – the most expensive debt of all. Rates are ONLY around 13.5% on average. I guess 27 times the Fed Funds Rate is a good deal. What would these banks ever charge if the FFR went back to a modest 5%? It probably won’t take much convincing for most people to understand the drop in the purchasing power of their paychecks. A quick trip to the grocery store is proof enough. But it isn’t just that. The ‘wealth effect’ of a bump in housing prices in select areas also puts a strain on affordability. The powers that be have applied all types of soothing ointments to grease the housing skids. The Chinese buying up property is probably doing more for the housing market at this point than all of Bernanke’s horses and all of Bernanke’s men. Housing is the great Humpty Dumpty. The red line is the BLS number. The blue line is an alternate derivation produced by economist John Williams using BLS’ retired methodologies. His derivation of CPU-U from 2007-present averages close to 10% per year where the BLS number averages around 3%. Now you can figure out for yourself which number more accurately represents your personal situation. Perhaps you’re somewhere in the middle. What I can assure you is that there are many more folks closer to that blue line than the red line. The big divergence started in 1993. Ironically, this is when the unemployment methodologies were also changed and around the same time that consumer debt absolutely exploded. These guys at BLS knew what was coming and jerry-rigged the methodologies to tone down joblessness, underemployment, and price inflation. So now how do you feel about the Dow regaining its 2007 level? Even if you regained every dollar from that last high, those dollars now buy considerably less than they did in 2007. How’s that wealth effect working now? So as I close this portion of the essay, do we really have a time machine and have reset to 2007 or have we in fact entered the uncharted territory of unsustainable, runaway trends the likes of which have never been observed in recorded history? This is only a sampling of the trends we could delve into; there are MANY others that can easily be examined. My second question to you is how relevant is the Dow Industrials Index in all of this? And economically speaking, how much liberty has been lost since the last time the Dow crossed 14K? I know full well this is generally a column about economics, finance, and markets, but there is absolutely no denying that all liberties are fairly closely entwined, be they civil or economic. A loss of one will result in the loss of another. Even more frightening than the attack on our economic liberties though is the onslaught against various civil liberties that seems to grow in number nearly by the day. Right now we’re in the marginalization stage. Groups are being marginalized based on varying political, religious, and social views, the government and the people are arming themselves to the teeth, and only a fool would be stupid enough to think that this will end well. Once the instigators have been able to gin up enough animosity, things will get really interesting. At least that is what will happen if history is any indicator. Much of this has been going on since long before the Dow last penetrated the 14K level so there is certainly no correlation, nor am I trying to imply one. However, if this is part of the ‘brave new world’ we’ve been told we now are a part of I think I’ll pass and go back to the boring old world. In fact, I’m clamoring for it, as should anyone else who is concerned for America’s future. Is there anyone who seriously believes that we’ll continue to have economic freedom if and/or when civil liberties have been stripped away? How much economic freedom do we even have now?